Our long time friendship began with out connections to SEEDS. Coming from the same 2004 cohort as previous interviewee, Amber Finley, I can say Jeramie and I go way back. The title to his story (Maintain and Proceed) is fitting in two ways; it comes directly from his response in this interview and it also articulates how I’ve always perceived Jeramie all these years. He maintains his joy and confidence and proceeds to work hard, exercising his dedication to science and outreach. When he mentioned he would be in town for a science conference for the American Geophysical Union (AGU), I quickly rushed to schedule a time for us to meet in person to “chop it up” and get his perspective down. And of coarse I jumped into getting to know his story first to learn about how his interest in Biology even started because in our years of friendship I never really asked him those questions. RR: So, who is Jeramie Strickland and what work do you do? JS: I’m a Wildlife Biologist with the Department of the Interior’s Fish & Wildlife Service. I work on the Upper Mississippi River National Wildlife Fish Refuge in Northwest Illinois, with some areas expanding into the Iowa side of the river. I manage 80 miles of river habitat (river refuge) including upland and lower land forests and sand prairies. This is federally owned land where I have opportunities to also work with private owners that have suitable habitat for wildlife. RR: From even your earliest years, it seems likes a lot of your interest comes from your interest in working with animals. Can you talk about where that interest comes from? JS: When I was 3 yrs old, my mom married my younger sister’s father. We relocated to Burmingham, Alabama. We grew up poor and my parents weren’t able to put me into afterschool programs or sports or camps. So I had to spend my non-busy time wondering off into creeks and streams, collecting crayfish and frogs and turtles. Being in Alabama I was fascinated with animals in their natural, undisturbed state. I also watched TV shows like the Wild America and The Crocodile Hunter. And my stepfather was very influential because he would take me out fishing and take me to other farms looking at animals that were used for food production as well as animals in their wild and undisturbed state. He, along with my 8th grade science teacher were able to use my destructive class behavior and turn it around and put me in a science fair competition. From there I went to an agricultural High school in Chicago and that helped line me up to Delware State University and it took off from there. RR: How did you gain interest in what you’re doing now at the Fish and Wildlife Service? JS: When I finished my BS in Animal Science at Delware State University I did internships at Michigan State and Purdue University with mainly farm animals. I was able to do a study abroad program in Namibia, Africa. Between that time frame and being the Student Coordinator with SEEDS, I was further exposed to Ecology and Wildlife Biology. This is what inspired me to go onto graduate school to pursue and advanced degree in Ecology. I’m originally from Chicago, so I was looking at schools within 5 hours from there and found Iowa State. I worked with a professor that has a good outreach program and reputation for working with under-represented students, Dr. Fred Jensen. So I contacted him and he had an established turtle camp field site. I started graduate school with him in 2006 working on a turtle project on the refuge. I also helped write the grant for a SEEDS Special Project Grant to work with underrepresented urban kids. We received the grant and the students presented final field data to the staff with a couple of F&WS district managers there. His field site is on the actual refuge in which I’m working on now, so more or less, that was my foot in the door. I finished my MS in 2008 and the job market was bad. I was able to get into a 12 week internship on the refuge to expand upon my graduate turtle work. The project I worked on as I was hired, was an Ornate Box Turtle population recovery project. These box turtles are a state-bred species due to habitat loss. Our refuge has remnant sand prairie habitat with viable populations, so I was able to help re-establish viable populations in those areas. So, me working at Iowa State and doing actual research on the refuge and continuing onto the internship is what got my foot in the door. After the 12 week internship I was able to get into the Federal Career Intern Program and that was a 2 year program. And the good thing about that is program is that you get full benefits and if you successfully complete it, you get non-competitively placed somewhere within F&WS. The field station where I was working as intern had a Wildlife Biologist position that was vacant for 5-6 yrs so I was able to fill that position. RR: Do you identify as being from the South or Chicago area? JS: Well, I was born in Chicago, relocated to Alabama, then in 3rd grade moved back into Chicago and spent rest of my life there. RR: Can you talk about the experience of understanding what work your heart was into and how your identity played a role in that? JS: I was always encouraged to follow what my heart told me to do and pursue a career I was interested in and something I would enjoy doing. So, I was interested in animals and I was able to see different viable careers and opportunities by working with animals. I was interested in animals, I stuck with it, I went to school to study it, and now I’m able to apply what I learned in the classroom out onto a landscape scale, whereI do research for habitat management to protect our natural resources. 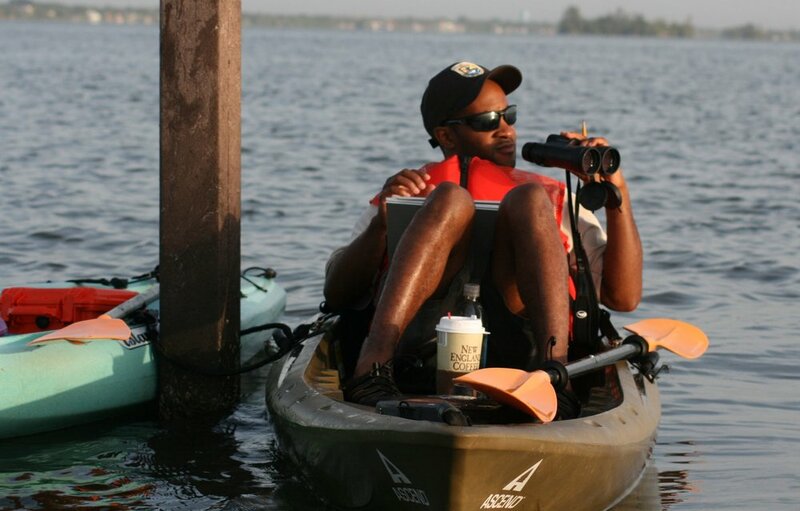 RR: What was your personal experience being an African American male in conservation? JS: Well, sometimes I would feel uncomfortable going to science related functions like workshops and conferences. I would be the only African American male, not just the only African American male, I was the only African American. So for a while it made me feel a little nervous. I’ve had some people say different racial remarks to me. But you know, I come from Chicago so I have some tough skin and I was able to ignore a lot of it. I wasn’t going to let that deter me from proceeding with my short and long-term plans. But yeah, for a long time it was very uncomfortable and somewhat depressing being that I had no one that looked like me or came from a similar background to reach out to for support or advice. But then I became awarded with different under-represented and minority-focused programs that connected me with different mentors to coach me and to help me realize that I wasn’t the only one under-represented. And that made a huge difference in having me just be an average professional, then going a step further to expand and build upon and give back to my community. Particularly to Southside of Chicago where gangs and drugs infest the streets and students there don’t have positive African American role models. RR: Are you doing any outreach work now? project looking at turtle biology. I also do other outreach within the community, whether going onto different colleges or elementary or high schools spreading word on conservation and natural resources to let them know they can have a viable career out of science and even STEM related disciplines. JS: Well first, financial support, mentors, and family backing me up every step of the way. Knowing I had someone to run to if I had question or concern, having someone listen to me and not judge me based on my past. Someone who took a valued interest in my future. And that’s the importance of having role models and mentors. By me having different mentors throughout different programs, that was the key factor of helping me go on and give back to my community and youth. RR: Did you ever reach a point where you struggled the mos? Do you remember any moment like that and do you remember who or what it was that helped you get through that period? JS: It was my junior year in high school. I was looking down the barrel of a gun and fortunately the gun jammed and didn’t go off. That was a turning point where I needed to get as far away from Chicago as I can and surround myself with more positive people. Otherwise, I knew I would become a statistic. So it got me outside of the negativity in the streets of Chicago. I needed to surround myself with people that were conducive to my success. That, combined with being rejected from different colleges and graduate programs, not being able to get good standardized test scores,... all of those rejections inspired me to make something out of nothing, to maintain and proceed. RR: So what tools did you use to get you somewhere more positive? JS: Networking was the biggest tool for me that opened up doors to other opportunities. It’s not what you know, its who you know. RR: I assume you carry with you this network of not only “people”, but knowledge of the work they do and your relationship to them. How have you utilized this network of people and your relationships to them in order to continue the work of outreach and increasing diversity? high school students on site have internship experiences and the target populations we were in-taking were more diverse groups. Some students have gone on to pursue Environmental Science degrees and some have gone on to pursue advanced degrees. This is the 7th year of the program and we are now at a time where we are able to document their success based on student participants from the first few cohorts. And we’re able to track students that were in high school then, and are now in college and graduate school. RR: Well, more on your networks…as an MS PHD’S (Minorities Striving and Pursuing Higher Degrees of Success in Earth System Science) student AND SEEDS student, you’ve utilized these (as a collaboration between the two) to continue the work of outreach and increasing diversity. These are both programs that aim to increase the participation of minorities in the sciences. Can you talk about how you’ve utilized these groups and what your perspective is now that you’ve worked to build bridges between multiple diversity programs? JS: Well, first my perspective. To have such a collaboration and partnership be successful, those in the leadership positions (who want those programs to succeed) must be passionate about what they do. They can’t be in it for the money or for the fame. They have to be in it because it’s their heart and soul. This means linking ‘diversity’ into the student experience and helping them through it. The people running the programs must care about such a mission. I like to think about former SEEDS Program Manager, Melissa Armstrong and an example. Any SEEDS student who has entered that program with Melissa undoubtedly, they know that she is in it for the right reasons. We need more “Melissa’s” in these leadership programs who will make meaningful differences in the lives of the students and audiences that these programs are trying to reach. Not to take away from anyone else, Melissa is just one that stands out to me. I’ve been interacting with Melissa since 2004 so, almost a decade now. She’s stood out right away. And 10 years later, she’s doing the exact same thing. She’s still passionate, if not, even more passionate now than she is about bringing diversity into sciences and making a difference in the lives of underrepresented students and other career professionals. I’m sitting here talking to you now while attending the AGU (American Geophysical Union) Conference in San Francisco. My presentation highlighted these two professional development programs, MSPHD and SEEDS. I presented the successes of both programs in regards to increasing diverse student participation in STEM related disciplines, I looked at the histories and compiled results from surveys of both programs, looked at how many students have come through the programs, who have earned MS or PhD’s, and how many of those are actively involved in communities doing environmental-friendly like work. I’m also doing outreach to AGU members about the programs. There are 10,000 scientists here; one of the biggest gatherings of scientist around because San Francisco is the only place in US that can hold that many people in a conference at one time. It’s been rewarding however, when it came time to do my Powerpoint presentation, scheduled at the end of the meeting, the evening of the last day. Which, you know at any conference, the earlier presentations get the most recognition and the most number of people in the audience. So, by it being on the last evening day of the conference, there weren’t as many people present in the audience as I would have liked. And they put me in the education section of the last day. I just asked myself, “How could a group or a society who talks the talk about wanting to increase the diversity and wanting to educate the public about it, how could they put that topic at the end of their conference?” Overall it went well, but we could have went a step further had it been scheduled earlier in the conference. RR: Interesting observation and an important point to make! Thank you! I want to go back to this notion of “change by an individual” and talk about Melissa Armstrong again. I was fortunate enough to come into the SEEDS program under her leadership, and I want say what I feel from Melissa (in what makes her passionate diversity work), is that she understands that the work shouldn’t be done in a top-down way. That “the way” you do the work of inclusion is to really allow us (students) to speak our minds and tell it the way we’re seeing it. And that she not hold any preconceived notions or assumptions about anything and direct the program that way. She approached it like, “Okay, you guys are the ones that make this program, what do you want from it?”. She knows that our voice is what matters. JS: Yes! Very well said. RR: And I know we share Melissa as part of our network, but do you personally have any particular mentor you can remember that encouraged you to make it through some of the tough times? Do you have an example of something that a mentor told you so you can navigate through your struggles? JS: In 2004 when I graduated from college, I graduated with an Animal Science degree and it was with farm animals. I got tired of working with pigs and sheeps and goats. It took me having a mentor through Michigan State who told me, “Jeramie, you’re not ready for graduate school right now.” He was honest with me, he was up front with me and said, “You have a talent for working with people and doing outreach.” And it was the most rewarding, most honest piece of feedback I received at that time. Immediately after he told me that, I got an email from Katherine Haufmann from SEEDS and it was an announcement for the SEEDS Student Coordinator position. My mentor at Michigan State…had he not given me that feedback in a meeting just before I had gotten that email from Katherine, I probably wouldn’t have look into the email or application. And it was that little piece of advice from that network…you know sometimes things in life come at you out of hand, but just sit back and be patient. Let things settle. It will take you on a whole different ride. I met Melissa when I interviewed for the position that same year. I was a little nervous and intimidated, but meeting her was kind of love at first sight. I new that the position would be challenging and daunting but I knew that Melissa was in it for the right reasons. And I knew that if I needed a shoulder to lean on, I knew she would be with me and fully supportive every step of the way. SEEDS and ESA was a stepping stone for me to craft my graduate application packet and the rest is history. RR: If there is something you want to leave about diversity in general, what would you like to say regarding the importance for it with respect to environmental careers? JS: I can’t stress the importance of having good role models and mentors; people who have been through similar situations and who have made it through and can guide you, coach you through the way. Even If I needed to get books, balance my school fees, a little bit of financial help here and there instead of working 40 hrs a week, meant a lot. The National Fish & Wildlife Service has allowed me to serve on diversity related committees and a recruiting team in our region (over 5 states in Midwest). The committees go to national offices to set aside funding for under-represented students, so we have special pots of money for intern programs designed particularly to get under-represented groups into the F&WS and the Department of the Interior. By 2016, 60% of the workforce (of all Fed Employees) will be eligible for retirement. Our refuge Chiefs and Area Managers realize we need to tap into these diverse applicant pools to reflect the demographic of America. And we all know that if we get diverse opinions, diverse thoughts and minds together, it will make whatever product more successful later down the road. The leadership realizes the importance of it and I’m proud to say that FWS and Dept of the Interior are putting their money where their mouth is and also allowing their staff to participate in different functions to get more diverse students to work in the natural resource and conservation fields. Particularly, in the last 2 years Obama’s administration put money into hiring youth interested in conservation. They have different intern programs and are also starting to make resources available to under-resourced students who are interested in FWS. Every year we hire thousands of students and hold specials slots for people of color. RR: Anything else you want to say as last thoughts? JS: We need more people like you to be Directors of diversity programs for non-profits. There are people like you and Melissa that make all the difference in the world. The people who are passionate about it. Not saying that anyone else isn’t but you and Melissa are ones that stand out from other people I’ve worked with. So, hopefully doors and opportunities with open up soon. And that’s the only way any organization or discipline is going to make a difference. They have to have the right people in leadership positions. In order to make a difference, we need more of you and “Melissa’s” in this world and I really, really mean that. I mean, someone who’s really in it for the long-term success of actually bringing diversity into the sciences. We need people who actually know what it’s like to be in our shoes. RR: Well, I appreciate that comment a lot. It’s not really about us. It’s about us allowing other people to have voices. So I think that’s the challenge with understanding the most effective ways to reach genuine inclusion of all people; that it should be driven by the people, and not one entity. And I thank you for sharing your story and contributing to that process. It allows me to push the agenda to make it about you guys (about us) and not a top-down method.